How does a Tag gun needle gets damage? 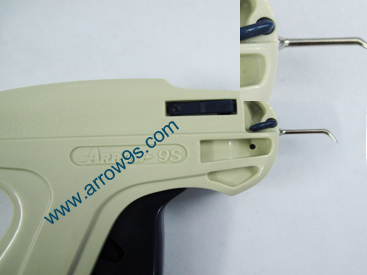 Arrow tag gun needles are made using high quality raw materials, and is very difficult to bend or get damaged in normal wear and tear. 1. 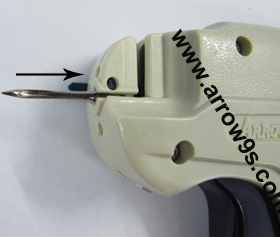 If needle cap is not put back after use of the tag gun, the needle of the tag gun may get dammaged during storage, since the needle may come in direct contact with foreign objects. 2. If you try to tag too thick and / or tightly woven fabrics, you may bend and damage the tag gun needle, due to excess pressure while tagging. 3. Mishandling while using the tag gun, (like dropping the tag gun while using ) can seviorely damage the tag gun. Please Note : Repairing tag gun needle is not advisable, so it is better to replace damaged tag gun needle at the earliest, or else it could lead to wastage of more tag pins, damage garment and / or damage Label gun inner parts. (a) Rotate the needle locker to the opposite direction making it parallel to the needle (b) Just pull out the damaged needle. Keeping the needle locker in the same position, insert the new needle in the same slot, ensuring the slot on the needle matches the slot on the Tag Gun body, until it goes inside the tag gun fully. Rotate back the needle locker into the original position and you are ready to tag agian ! Label Gun jammed with Tag pins. If the user is applying extra pressure or insufficient pressure for Tagging, it may lead to tag pin jam. Or, if the tag gun needle is bent, the movement of the tag pin will not be smooth and could result in tag pin jam. Dust in the tag pin movement area may cause tag pin to get jammed inside the tag gun. 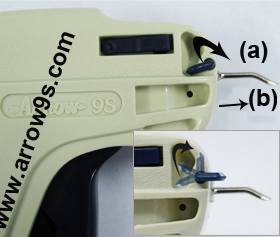 More importantly, please ensure you use only standard tag pin 50 pc, with this model of Arrow 9S tag gun. Use of improper type of tag pin will surely lead to damage of tag gun itself. 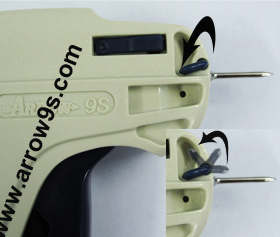 Repairing Tag gun is easy if it gets jammed with Tag Pins, if few steps are followed properly. * Remove the Tag Gun Needle and make sure it is not damaged,. If it is damaged, then replace the needle with a new one, as explained above. * If the needle is in good condition, then check for unused tag pins, or any duststuck in the needle or the tag pin movement area. * Clear all dust, re-fix the needle and enjoy smooth tagging again.